Volleyball played at the junior high school level is similar to the game played at the high school, college, professional and Olympic levels. However, there are some differences in the number of games that young players at this level may play in a given season or in a week during the season. The height of the net can also be lowered if team members of the conference agree. 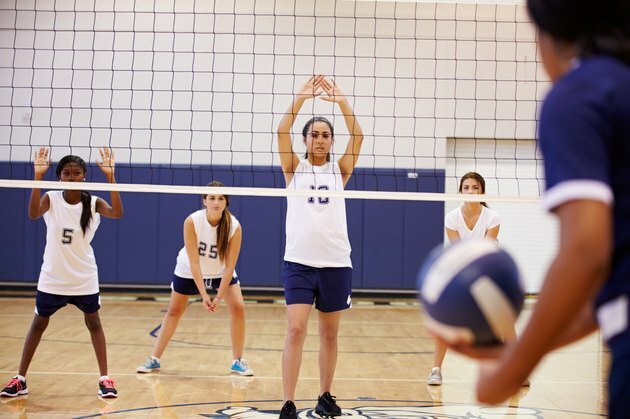 Junior high volleyball can go to practice regularly and participate in matches, but the number of those matches are limited each season. To prevent the young players from putting too much stress on bones, joints, muscles and tendons that go with the constant jumping needed in the sport, teams may not play more than 14 matches in the regular season. Teams may play up to two matches per week, but they may not exceed that total. If a doubleheader is scheduled, it is considered one match and does not preclude a team from playing another match that week. Junior high volleyball matches are held in a best-of-3 format. The first team to win two games wins the match. At the junior high level, games are played to 15 points. The vast majority of junior high leagues use the rally scoring system. In rally scoring, a point is awarded to either team after the ball is put out of play. If the serving team wins the point, it gets a point on the scoreboard and retains the serve. If the receiving team wins the point, it gets a point and earns the serve. In some cases, side-out scoring is used to determine the outcome of matches. In that type of match, the serving team gets a point and keeps the serve if it wins the point. However, if the receiving team wins the point, it only gets the serve and does not get a point added to the scoreboard. The net in junior high volleyball is determined by the International Volleyball Federation. The organization has prescribed the height of the net for boys and girls who are 13 and 14 should be 7 feet 4 1/8 inches high. Boys and girls who are 12 and under, should use a net that is 7 feet high. However, if all member teams in a conference agree, the height of the net can be lowered to 6 feet 4 inches if it is deemed that the height is appropriate for the skill level of the participants.